This month Kelapo is introducing their all new coconut oil cooking spray with no soy! So we are celebrating by blogging about all of the great uses for cooking spray. Chef Jessica’s whole grain pancakes is just the beginning. There is just something about pancakes that makes getting up more worth it. It stands to reason that any food with the word “cake” in it should help bring out a smile. 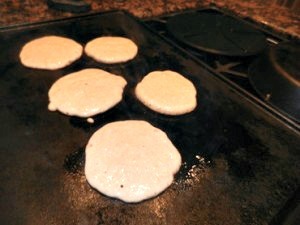 For my kids, pancakes aren’t just one of their favorite foods to eat, they also enjoy helping to make them. 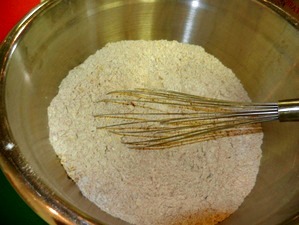 We often whip up our own whole-grain pancake mix in big batches then store it in an air-tight container. Thanks to this, it literally only takes a couple of minutes to whip up tasty, delicious pancakes that are actually good for you! 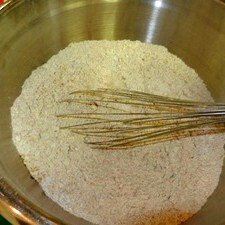 Combine all ingredients in a large bowl; whisk together until well blended. Store in air-tight container. It makes a wonderful gift or pack-along for camping. Spray griddle with coconut oil cooking spray then pour. 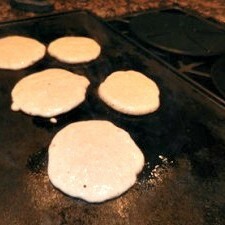 Heat your griddle to medium heat and melt coconut oil. Whisk together egg and buttermilk; stir in pancake mix until smooth, adjust thickness of batter by adding more buttermilk or mix if desired. Pour a spoonful onto pan and cook for about a minute, until you see bubbles on the surface; turn and then cook for about 30 more seconds. Serve with your favorite pancake toppings.